Writing is very personal, too personal. I have not wanted to talk about what has been going on because I just start crying. I can’t write when I am crying, but the ink will not be ruined. My Grandma Frances died last Sunday. I got the call from my Aunt, I knew this, the week before, I felt it the week before and wanted to talk to my Grandma and Aunt. But I have been having migraines, horrible debilitating migraines, where I don’t even know where the days go migraines, and every night, I just wanted to take a warm bath, lie down with my lavender eye pillow, and wish my migraine away. I miss my Grandma. She was 92 years old, I thought she would live forever. I can hear her voice now saying, ” I’m not young Lynnette”. I remember her saying that to me when I was 5, how old was she? Younger than I am now….I can’t pick up the phone and talk to my Grandma, I can only speak to her in my mind. I know what she will say. I know we will both laugh. Grandma made me Biscotti every year. For my Birthday and for Christmas. Every year, as if her life depended on it. It started, I didn’t get a box in the mail, when I didn’t receive the box of Biscotti, I knew she felt terrible that she could no longer make them for me. She felt worse than I did. I loved those Biscotti, as soon as the box arrived in the mail, I would hide them so that my family didn’t eat them all, that day. I didn’t make Biscotti because Grandma made them best. But I do have the recipe and one day I will try to make them. They are twice baked, so a little more effort. I will try to be strong and bake a batch for Grandma. My Grandma was an amazing cook and baker. She loved that I had a food blog. I remember when she cooked dinner and served everyone, she would stand in the kitchen and watch everyone eat. We begged her to come sit with us and eat. Grandma’s family were farmers and they would make a huge meal for lunch, because they would work it off, course after course after course, the Italian way. I loved her lasagna, I loved her thumb print cookies. I dream of her thumb print cookies. One time we made them together and I wrote the recipe down as we baked them, that was over 40 years ago. She always watched what she ate, she exercised and took care of herself. She smiled with her eyes, we sang to each other every time we spoke on the phone and when she wasn’t singing to me, I would put hubs on the phone and have him sing to her. I knew she absolutely adored him and his singing, we laughed and laughed about everything, she had the best sense of humor, my Grandma. Wishing this wasn’t the last time we spoke. What did we talk about the last time we spoke? The weather? Our health? The kids? Work? I don’t recall, I just know that I always loved talking to my Grandma, she always knew the right thing to say to me, I always felt better when we spoke. I love you Grandma. Thank you for always loving me. I miss you. I have never made lemon bars, but they are one of my favorite bar desserts. 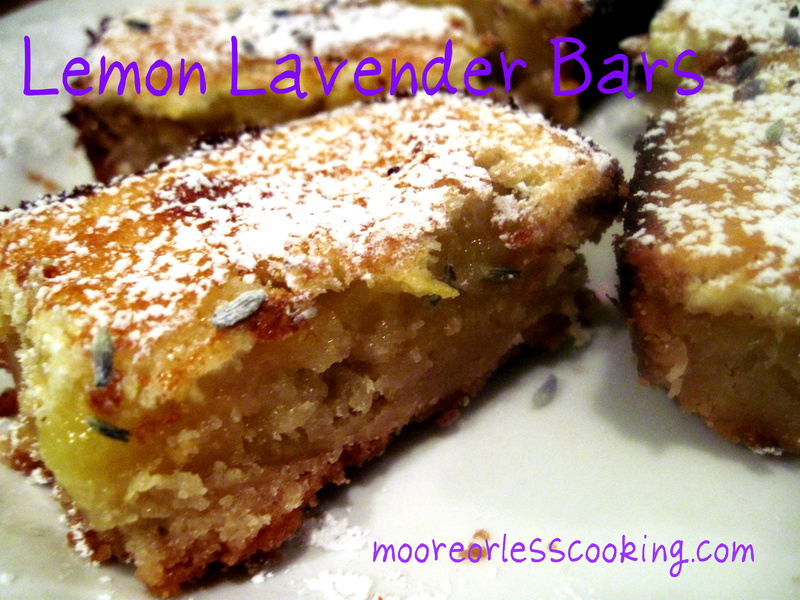 I had no idea how much I would love the combination of lemon and lavender, it is perfect and lemony tart with a light lavender flavor and a sweet and crumbly shortbread crust. 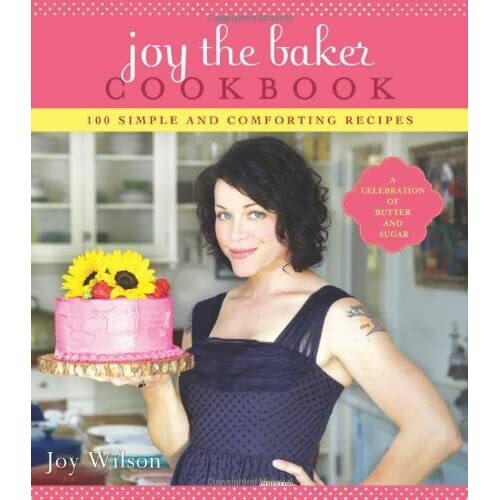 Joy’s book officially hit the shelves today! Click here to purchase your own copy and check out her blog to see if she’ll be in a city near you to sign it. Preheat the oven to 350 degrees. Butter a 13×9 inch pan and set aside. To make the crust: In the bowl of a stand mixer beat together butter and sugars until pale and fluffy, 3-5 minutes. Stop, scrape down and add the flour, salt and lavender. Beat on low until dough comes together. Dump the dough into the pan and flatten out with your hand until the base is level. Bake for 18-20 minutes or until slightly browned. To make the filling: While the crust is baking, In a medium bowl whisk together the eggs and sugar until pale and light. Add the lemon juice, flour and zest. Whisk until completely incorporated. Remove the baked crust from the oven and immediately pour the prepared filling over the crust. Return to the oven and bake for 25 minutes or until browned around the edges and no longer wobbly in the center. After it comes out of the oven sprinkle lavishly with the powdered sugar and dried lavender. The bars will stay fresh in an airtight container, in the fridge for up to 4 days. Hi Nettie, I had noticed that I wasn’t seeing very much on facebook. I am so sorry for your loss. In a lot of ways you were saying everything I have been feeling lately but not wanting to write about in my own blog. I thank you for sharing your feelings so eloquently and sharing a very personal piece of you. I could feel your pain and loss and can see the fear in myself. I am lucky that mine is not a loss but the fear of losing my husband as we face another heart surgery. I haven’t shared it yet on my blog. You reminded me how important life is and making memories with each other. It sounds like you had a very special relationship with your Grandma and have such amazing memories. So many people never have that relationship with anyone. I am so happy you have them and you have inspired me to keep pushing the fear and anxiety back so that I can truly enjoy the moments. Thank you so much for sharing. Sending you a big cyber HUG! Oh, Nettie, I am so sorry for your loss… I know how you feel, I lost my grandfather a couple of years ago and it just broke my heart. Thank you so much for sharing this part of you and your life with us. My thoughts and prayers go out to you! Please feel better. Also, your lemon bars look delicious! I am so sorry for your loss, Nettie. I know how heartbreaking it is, and how putting it into words somehow makes it even more real. I lost my Grandfather (99yrs 9 mos) the following year my Grandmother (93) and then my Step Father. It was hell at the time, but I look back and it’s sweet too, because my kids knew them all. Pictures with that generation and with my kids used to make me cry. Now, with tears in my eyes, I smile. Oh friend, I am so sorry for your loss. Your grandmother sounds wonderful Nettie, and I hope your happy memories of her will keep you smiling through your grief. I am so sorry for the loss of your precious Grandma. I love how you said, “She smiled with her eyes, we sang to each other every time we spoke on the phone”. <3 So beautiful, so moving. I’m so sorry for your loss. But, it is wonderful that you have so many fond memories filled with love and laughter. It sounds like your Grandmother was an amazing woman who expressed her love by cooking for her family. I guess she passed that character trait to you. I am so sorry read about the loss of your Grandmother. She sounds like she was very special. I lost mine in my late 30’s and I still miss her very much. I wish I had spent more time going up to visit and learning to make her recipes. I would give a lot to be able to make her Chicken N’ Dumplings. They were the best. Treasure your memories. They will be with you always and will keep her with you in your heart. I also hope your migraines get better. I have had a few but probably not as bad as yours and you have my sympathy. What I had was horrible but only lasted a few hours. To have them last longer must be truly horrible. I hope life looks up soon.